Welcome to 1235 Via Belcanto. This near 3,400 square foot estate is located in the prestigious gated San Miguel community of Canyon Springs. It boasts 5 bedrooms with 4 full baths and multiple living and dining spaces, along with luxury finishes and upgrades. 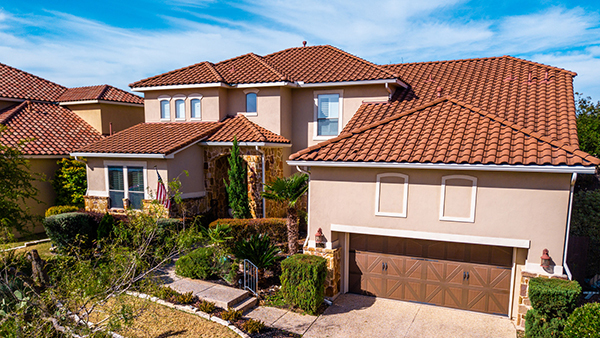 With access to highly rated NEISD schools, and close proximity to shopping, dining & championship golf, yet no city takes, this community is very desirable. Residents of Canyon Springs have access to a top class amenity center with pool, tennis, basketball, a playground and jogging trails. Canyon Springs golf club is conveniently located within the community as well. As you approach the residence the professional landscaping and 100% masonry exterior with clay tile roof immediately catch your eye. The grand entry with 8′ wood door, glass insert and 2 sidelights continues to impress. You walk into a 2 story entryway with chandelier art niche, all lever door handles and 18×18 ceramic tile. There’s a large dining room with archways, crown molding, natural light, hardwood floors and chandelier. French doors open to the private study with ceiling fan more hardwood floors and crown molding. More archways lead to the living room featuring gas fireplace, 2 story ceilings with abundant natural light, plantation shutters built in speakers and ceramic tile floors. The eat in chef’s island kitchen has matching GE profile appliances with double ovens and smooth cooktop. There’s granite countertops, a custom tile backsplash, a breakfast bar with stone and under bar lighting, a huge walk in pantry, breakfast room with hardwood floors and bay window, reverse osmosis drinking water system, oil rubbed bronze fixtures and under cabinet lighting. The private master bedroom is located downstairs. It features modern wood laminate flooring, double crown molding, separate sitting area with bay window, built in speakers and a large walk in closet. The huge on suite master bath boasts his and hers vanities with granite counters, stained glass, a corner jetted tub, separate walk in mud set shower with Delta fixtures, ceramic tile ceiling fan and water closet. There’s also a second bedroom downstairs with access to the 2nd full bath. The winding staircase with iron spindles leads to the upstairs landing. It connects to the huge game room. Bedroom 3 upstairs functions like a 2nd master suite with its full on suite bath. The 4th and 5th bedrooms hare the 4th full bath and all spare bedrooms boast ceiling fans, plantation shutters and ample closet space. The backyard with stained privacy fencing has a big covered porch with ceramic tile, ceiling fan, outdoor kitchen with gas cooking, mature trees, a multi level deck with gazebo and hot tub. There’s even a custom built putting green. Finally, there’s a water softener, sprinkler system, rain gutters and built ins in the 2 car garage. To tour this home or find out more information, simply contact one of our REALTORS, today.